From a full range of sizes to unique flavors no one else offers, we have a sweet solution for your every need. 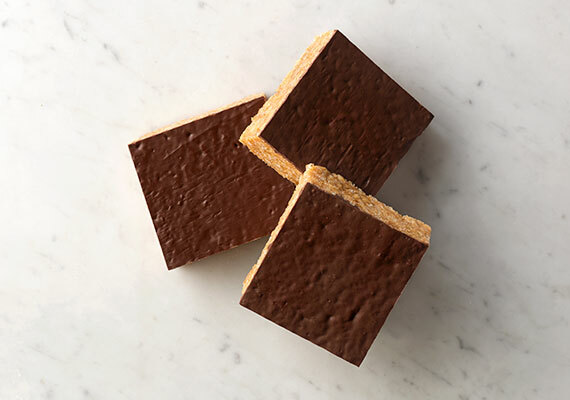 Our gourmet crispy bars and brownies come in a variety of sizes and are available in trays and individually wrapped. Just thaw and serve, and your customers will think they’re homemade. This all-American favorite is made with the buttery goodness and crispy rice customers love. Better yet, they’re convenient and ready-to-sell – just thaw and serve. Available in trays, slabs, bites and individually wrapped as well as sheets, our gourmet crispy bars are perfect for parties and catering. Made with sweet cream butter, velvety marshmallows and crisped rice, you can’t go wrong with this all-American favorite. We took creamy peanut butter, blended it with crisped rice and topped it off with chocolate butterscotch icing. That’s delicious times three. 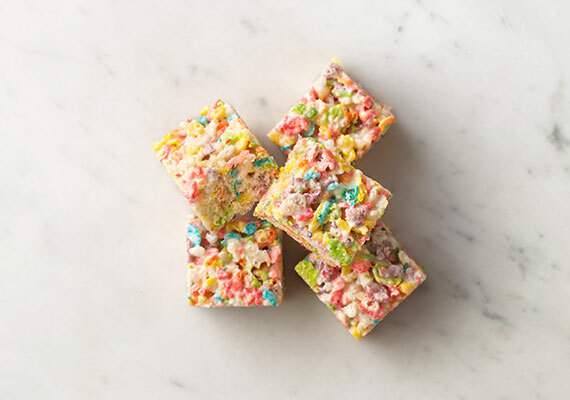 Multi-colored, fruit-flavored crisped rice and marshmallows make this a favorite for kids of all ages. 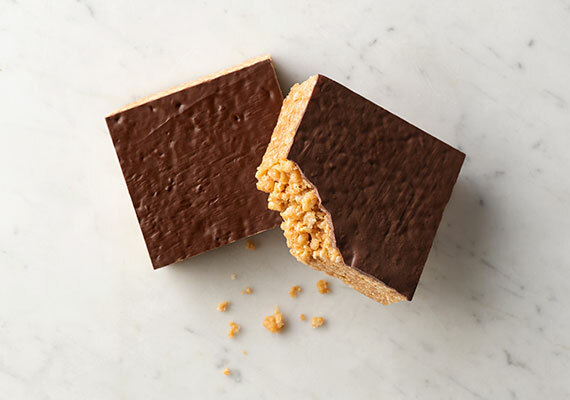 Mixed with sea salt, caramel bits and marshmallow pieces, we took our traditional crispy bar recipe and made it nearly impossible for customers to resist. Your customers will love the frosting-and-sprinkles birthday twist we put on their favorite childhood treat. We blended our sweet cream butter and marshmallow with crisped rice cereal, whole marshmallows and real M&M’S® candies. It doesn’t get any better than blending our chocolate-flavored crisped rice with sweet cream butter and marshmallow. Except when we add whole marshmallows and chocolatey chips. A decadent base of creamy peanut butter is blended with crisped rice cereal, topped with M&M’S® candies and peanuts, then brought to perfection with a light drizzle of chocolate flavored icing. Crisped rice cereal and whole pieces of mini marshmallows are combined to create a creamy, buttery marshmallow fusion. All the homemade deliciousness of our gourmet crispy bars – individually wrapped for customer convenience and easy impulse purchases. Perfect for restaurants, delis, convenience stores and vending machines. Available in retail ready clamshells, these crisped rice bars are everything a sweet snack should be. We begin with classic flavors then add fun ingredients and toppings making them nearly impossible for customers to resist. 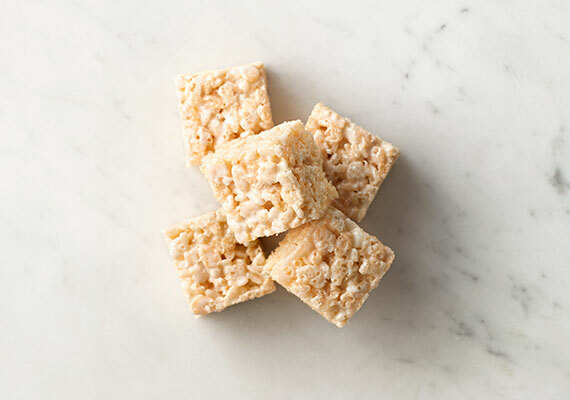 This classic treat of creamy marshmallow and crisp rice is a hit among both kids and adults. Graham cracker crumbles and chocolate pieces top this campfire inspiration. Pops of brightly colored, fruit-flavored crisped rice make this an eye-catching favorite. The goodness of our Original Marshmallow Goodies come ready to enjoy with festively decorated with colorful sprinkles. Crispy and irresistible, these marshmallow and crisped rice bars come individually wrapped for convenience and Grab and Go purchases. Brownies just like grandma used to make – that’s what customers love about our chocolatey-delicious recipes. Going above and beyond to meet your every need, we think you’re going to love them too. Made with the freshest ingredients, it’s hard to resist the homemade flavor of our brownies. They come in sheets, perfect for parties and catering. Just thaw, serve and that chocolatey goodness is ready to go. Rich and enticing, we top our chewy fudge brownies with creamy chocolate-fudge frosting. How do we make our rich, chewy fudge brownie even better? Sprinkle real chocolate chunks and drizzle chocolate icing on top. This rich fudge brownie base is topped with a “magic” layer of chocolate chips, butterscotch chips and coconut. Whether you’re looking for massive quantity, co-manufactured custom recipe production, or a great brownie to use as your in-house brand, South Coast Baking can deliver the goods. All the homemade deliciousness of our gourmet brownies – individually wrapped for customer convenience and easy impulse purchases. Perfect for restaurants, delis, convenience stores and vending machines.